EXCELLENT piece by our friend and environmental scientist Vijay Jayaraj on the recent mass hysteria over the supposed “hottest day evah” in the Arctic. This week, social media and mainstream media were abuzz with news about the record Arctic heat and how we humans are destroying our planet through climate change. While we brace for a barrage of climate doomsday news, here is the actual reality of climatic conditions at the Arctic and reasons why we are not in imminent danger. On 26 February, temperatures in some regions of the Arctic hovered around the freezing point (zero degree Celsius)—a record high for this time of year in the satellite era temperature readings (which began in the late 1970s). But the current rise in Arctic temperature is due not to changes in global average temperature but to changes in regional weather patterns. Changes in the weather system across the Scandinavian region are pushing very warm, moisture-laden Atlantic air into the Arctic and very cold Arctic air into Northern Eurasia, leading much of Europe into a deep freeze this week. The same has been prevalent over North America this week, resulting in a colder than normal winter in some parts while temperatures soar towards the east coast. To understand the sudden peak in arctic temperatures, it is critical to analyze two key elements associated with the Arctic climate: 1. past temperature trends, and 2. the historic variations of the sea ice cover in the Arctic. Temperature records for the Arctic reveal that the current rise in temperature is not unusual. The weighted Arctic (70–90oN) monthly surface air temperature anomalies (from HadCRUT4) show that average surface temperatures in the Arctic have not increased significantly since the 1930s. Long-term (1880–2018) Arctic surface annual air temperature series from Nuuk, Greenland, show that the high temperatures in the recent years are not significantly higher than the previous 14 decades. Climate alarmists argue that these high temperatures lead to extreme reduction in sea ice levels and upset the eco-system of the planet. However, sea ice variations reveal a similar pattern to that of temperature—there has been no extreme reduction of sea ice in recent decades. The latest studies on Arctic sea ice indicate that sea ice cover during the 20th century did not depart significantly from the record sea ice levels during the Little Ice Age (1600–1700 AD). And understandably, the sea ice cover was at its 2000-year low during the Medieval Warm Period (1000-1200 AD) and during the Roman Warm Period (around 0 AD). If one were to consider longer temperature data series, such as the entire Holocene (the warm climatic era that constitutes the last 11,700 years approximately), we have no reason to panic about sea ice cover. Sea ice cover in the 20th century was at its highest ever (excluding the Little Ice Age of 16thcentury) in the last 11,000 years. Solar activity, and not carbon dioxide, was found to be the main reason for changes in the historical sea ice variations. The current sea ice loss is not extraordinary by any means, and the Arctic ecosystem survived through much lower ice cover extent in the past 2000 years. Lying about sea ice and temperatures is not new for the climate alarmists, and their hypocrisy will surely reach new heights this spring. Vijay Jayaraj (M.Sc., Environmental Science, University of East Anglia, England), Research Associate for Developing Countries for the Cornwall Alliance for the Stewardship of Creation, lives in Coimbatore, India. There is absolutely nothing unusual about today’s so-called global warming (or “climate change”). 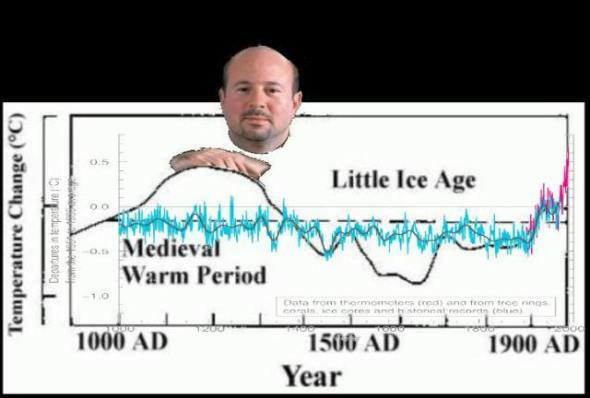 Civilizations flourished during those warm periods, and collapsed when they ended. Did humans cause the Minoan warm period of of about 3,300 years ago? Now look at where we are today (at the far right side of the graph). As far as I’m concerned, all this talk about human-caused global warming is sheer nonsense, if not downright fraud. The record shows that both periods of warmth – and periods of cold – hit our planet with almost consistent regularity. The above chart is based on data from GISP2 (Greenland Ice Sheet Project 2). GISP2 drilled cores into the Greenland ice more than 3000 meters (almost 2 miles) deep, allowing scientists to study climate variability for the past 125,000 years.